North of Narrabri: Benchwork begins. . . Finally--some benchwork is added. 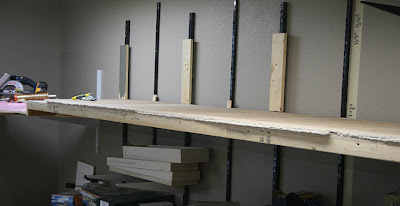 The plywood/ceiling tile/l-girder structure atop the shelving brackets. . the styrene backdrop will be glued/stapled to the vertical wood pieces. Most of the upper level of benchwork has been erected. I figured I'd at least get this portion of the railroad in place first, as it would determine the elevation from which the in-wall spiral would descent from--54" rail level above ground height. 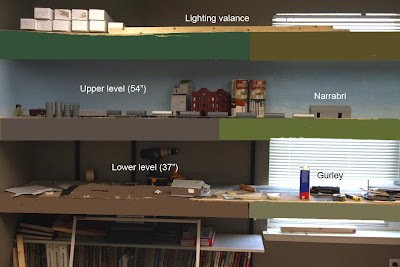 The rail height of the lower level would be "around" 16 inches below this--or 38" high. . .among the operations crowd, this would ensure a layout not tall enough on the upper level, and too lower for a lower level. But, double-deck layouts are strange beasts, fraught with compromises. One key in double deck layouts is to make the thickness of the upper-level benchwork as thin as possible. In addition to the rack, and the roadbed and the benchwork itself is the under-deck lighting which must be hung from the underside of the upper deck as well--figure at least another 2" in depth for that, using T8-sized flourescent tubes (which though pricey, are ideal for this linear application. 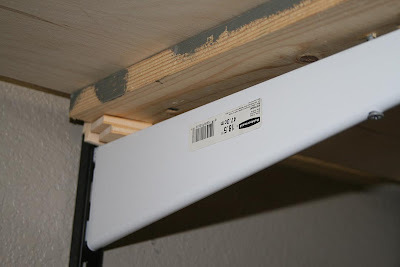 A good look underside of the shelving brackets atop which rests the benchwork itself. Close look at thin wood shims atop the wall-end of the brackets to keep the benchwork level. The upward cant of the brackets is the only downside, I feel, in using them. 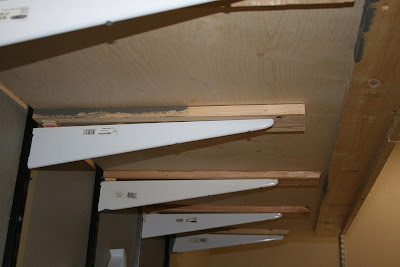 To reduce the tendency of the plywood to flex, dip and bow, an L-girder (a 1 X 3" or 1 X4" stud abutting a 1 X 2" piece) is screwed parallel and along the front edge of the plywood. This also provides a sturdy base to attach fascia on the front of the layout. The sub-roadbed is layered Armstrong acoustical ceiling tile--"poor man's homasote". I scoffed at its application when Donovan in Dallas used it on his layouts, but after seeing what a nice surface it gave Harry Bilger on his Moscow, Idaho layout up in Whitesboro, I was sold. This material can be stacked and contoured to make low-level landforms, and once you get the dust problem solved while cutting and planing it to shape, it's a great material to work with. So, how thick is this upper level? Let's figure 1" for ceiling tile and plywood, and another 2 1/4" for the L-girder--that's 3 1/4", and the fascial will probably hang another 2 inches lower than that. . . 5 1/4". That'll leave 11 3/4" "clear" between upper and lower levels. As reknowned model railroader and editor Tony Koester would say, "not great, but adequate." A long strip of .030" thick styrene sheeting used on the previous layout for backdrop was attached to the wall bracket uprights, and just like that, it was starting to look like a layout! All I was missing was track. . . structures. . . railway equipment. . .and fascia! Here's a photoshopped test of several possible colors for fascia. Speaking of fascia, with the first sections of layout in place, it seemed to be a good time to mock up the two levels and overhead light valance for a photograph and photoshop in the fascia as a test to see what color might work best. Do you have a preference? Narrabri mocked up. It won't be long before trackwork can commence. 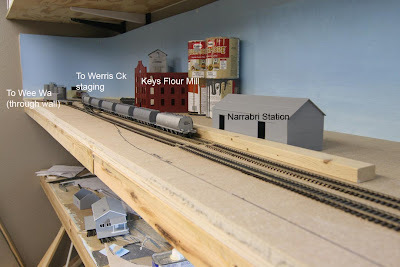 . .
With the upper level largely in place, I couldn't resist the urge to throw down some pieces of flex track, position them about where they'd be in the Narrabri West yard, put down a few pieces of railway equipment, and mock up the scene. I often think about how scenes would look when I plan a layout, so when I reach a point to put a quick mock-up down, I don't hesistate to do so. Next: build me a river bed. . . a deep blue sky. . .and a mystery package from Canada arrives. . . . Here's what I'm aiming for. . .